Today’s post is going to be a bit different, than my usual! Want to make it a more social awareness/personal type post! So i’m sure everyone knows who Malala Yousafzai is by now. Being a Pakistani girl myself, and i’m sure other Pakistani girls can relate, her story touches us in more than one way. I have never lived in Pakistan in my life, so in some ways i cannot understand the true hardships people go through, who live there. But hearing & watching the news from my parents and the Pakistani TV channels, keeps me somewhat aware of what the situation of our homeland is like. When Malala came into the limelight, it was a huge deal! Not just for Pakistanis, but for everyone in the world. Here was a girl who was SHOT for standing up for education. How absurd is that? But it’s the sad reality of the world we live in. SO many countries and areas around the world, do NOT let girls go to school. It’s sad to think that in 2015, we still live in the world where such ignorance is present. I read Malala’s book a few years back, after it came out. I found it pretty interesting and found out way more than what I was seeing and hearing on the news in those days. Recently, they turned her life into a movie/documentary, that my family & I watched last month. Normally, I always like books better than their movie creations, but given that this book & movie were so different than the usual fiction novels-turned-movies, I couldn’t really compare the two. Yes, the story is overall the same; but what you see and understand from the movie is not comparable to the book. You get to see Malala being a kid. Her awkward, funny, and witty self. She’s annoying her brothers and playing games with them, and i love seeing these heroes and leaders of our world; acting like a real person. Showing her family life, home and personal life in school. It made me appreciate her for a real person, rather than this advocate persona she’s painted in the limelight. She hasn’t let the fame get to her head. She still dresses, speaks, acts the same way. She definitely has kept herself grounded and keeps her morals straight. I like seeing such strong personalities especially in girls! If you’ve read some of my previous posts, you’ve seen how much i love, care, speak about, and miss my school/college days. There is NOTHING in the world that will compare to the time you spend in school. People like Malala, should make us all realize, especially us living in the USA, UK, or any modern western world, that we are truly lucky and privileged to be getting education. So many kids complain, cry, and drop out of school; but there are even more kids in the world who aren’t even given the chance to go to a school! It is a true gift and blessing that we should cherish, and make the most of. Be grateful for the education you have & receive, and share that with the next generation. I’m always preaching the importance of education, especially higher education, and i LOVE seeing girls in our INDO-PAK-DESI community, getting double, triple, doctorate and PHD degrees. There should be nothing in the world stopping you from getting educated. Knowledge is the true power in this world, and with it you can change the world. SO for anyone who hasn’t seen the movie or read her book….do yourself a favor and do so! It’s something anyone can relate and learn from. I hope Malala succeeds in all of her missions to help the world. Donate to her fund and help her, in her goal to eliminate the lack of education for the 60 million girls around the world! 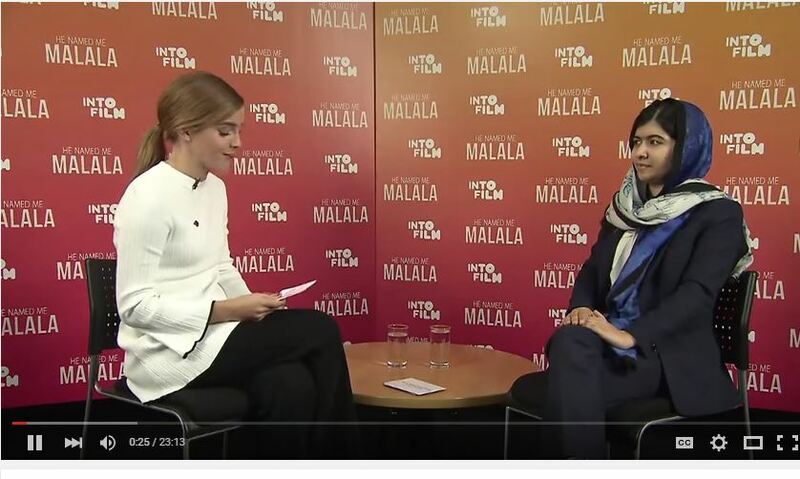 To end, i leave you with this superb interview that occurred recently, between Malala…and my other lifetime favorite actress, Emma Watson. Harry Potter is my favorite series of all time, so naturally Emma is a favorite. They discuss the movie, and other questions from the audience. Take a look at their interview here. Don’t forget to follow me on Instagram to stay up to date on my blog. I’d love to hear from you, check out how you can contribute to Sprinkle of Surprise, by clicking right here. Mashallah. Malala is more articulate at 18 than I will ever be. Thanks for sharing. Really inspiring post 👍. I agree, we all should be grateful for everything we receive 😇. This was a great read! Malala is such a inspiration for standing up for what she believes in.